Knitted booties look complex, but these are anything but. 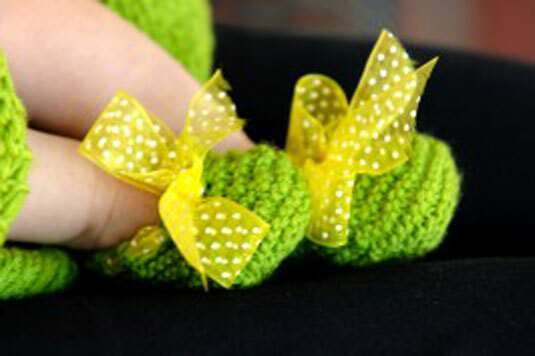 The ribbon trim on these knitted booties pull together the edges to create the tops and close across baby’s feet. With size US 6 needles, cast on 38 sts. Rows 1–6: Work in garter st.
Row 7: K2, m1 in next 2 sts, k10, m1 in next 4 sts, k2, m1 in next 4 sts, k10, m1 in next 2 sts, k2 (50 sts). Row 9: K17, m1 in next 4 sts, k8, m1 in next 4 sts, k17. Rows 10–14: Work in garter st.
Row 15: K17, (k2tog, k2) twice, k2tog, k4, (k2tog, k2) twice, k2tog, k17. Row 17: K17, (k2tog, k1) twice, k2tog, k2, (k2tog, k1) twice, k2tog, k17 (46 sts). Row 19: K17, k2tog 6 times, k17. Starting at the cast-on seam, sew along the seam and up the side to form the bootie. Thread ribbon or I-cord through the final row for decoration, if desired.